Hoping you’re ok this fine morning. What’s that? How am I? Well glad you asked cos I’m annoyed. Very annoyed. You see nothing annoys me more than a bad viz and I’ve finally had enough. Here’s why. Trekking into central London on our beautiful commuter service is a joy. Actually it’s not, it’s a colossal pain. But anyway, it gives the brainy marketeers of all sorts of companies a chance to display their wares in more elaborate and interesting ways. And that’s ok. There are hundreds of meters of blank wall to slap a fancy advert on, or let us know some cool fact or bit of info that’s going to make our day easier. And there are lots. Adverts for the latest technologies and fancy holidays all of which are good enough and inoffensive, sometimes very well done. 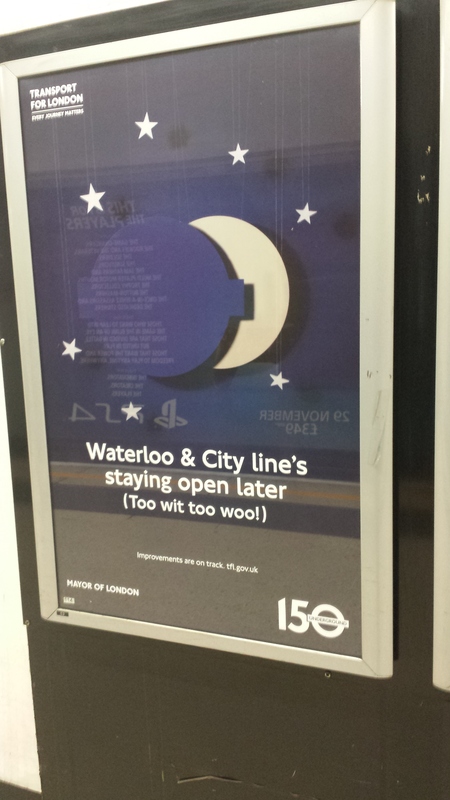 And then there’s London Underground. Now they own the damn place, so can display pretty much what they want, where they want it – you know for maximum impact. But what do we get. We get this (pictured left). Well that’s inspirational. Really. 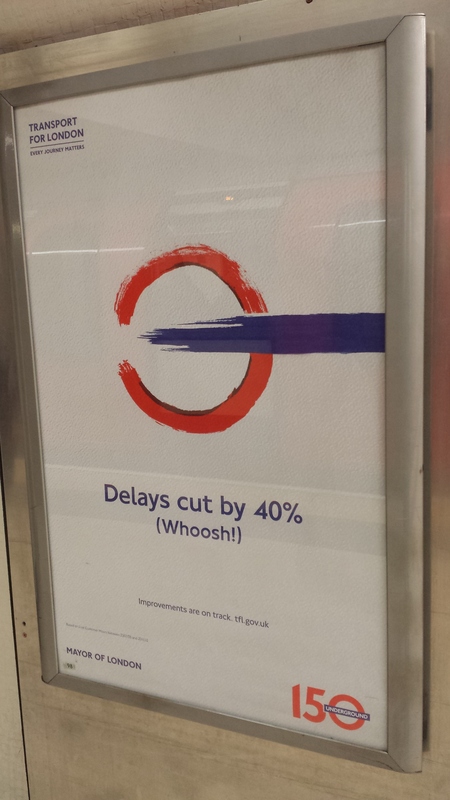 London Underground get a load of grief for delays and such like, and there’s no doubt that a 40% improvement is something to shout about. SO SHOUT ABOUT IT! Tell me what you’ve done. Where are the biggest improvements? The Northern Line? The Jubilee Line? What time? Rush hours? What have been the benefits? Even draw me a little infographic or something. Anything more than a meaningless logo and a stupid tagline. What a wasted opportunity to really boast about the work you’ve done to the network to someone who walks past this poster 4 times every day. And there’s more. Here’s another example. This time banging on about their range of informative Twitter feeds. That’s great. Getting some up to the minute Tweets about the service would be just the ticket. Let me see – I’ll follow erm… and erm… ah. So how much effort would it be to display what those hashtags or accounts actually are? I do quite like the graphic though I’ll give them that. Utterly lazy and completely missing the value of the interested audience of tech-savvy people who pass by this poster hundreds of times a year. Sure I could go to the URL they’ve specified but still…. And here’s the final one. I don’t even think I can be bothered to comment on it as it makes my blood boil. I often wonder how many of my fellow commuters are thinking the same thing as they walk past these non-information posters. We’ve all got a thirst for INPUT – I’m a total Johnny 5 these days, so I see things like these posters as massive wasted opportunities to put a positive message or useful information right in my face so I can’t avoid it. Years ago I would probably have been offended by that approach, now I’m annoyed that they haven’t at least tried. Especially for an organisation that gets endless grief for performance. You’d think they’d be all over it. Clearly not. Ah well that’s it for the rant. Have a good day everyone, and remember to use all available doors. 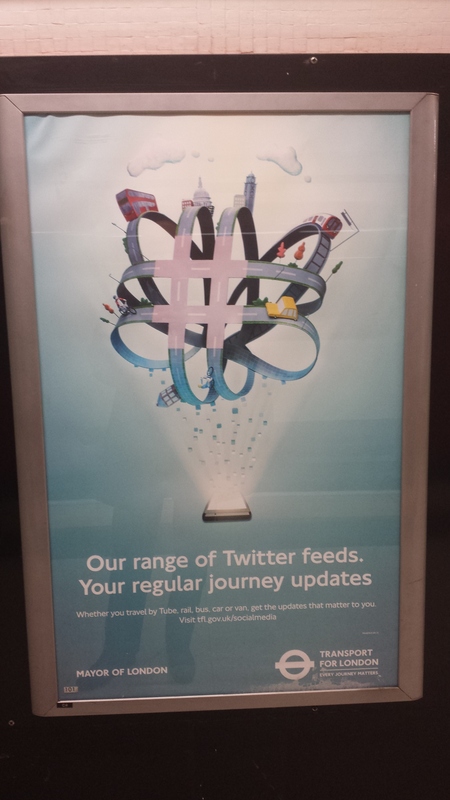 This entry was posted in Opinion and tagged adverts, data, london underground, marketing, social, visualisation, viz by paulbanoub. Bookmark the permalink.